Have you ever Googled your name? Out of curiosity, I have. Well, the curiosity of it was to see who else shared my name. The moment I found out how many women out there shared my first and last name it was too late to change my name on my book cover. I should have known better as I have a cousin that shares my name, until she got married a few years back. There’s a famous home interior designer that shares my name, as well as a newscaster in Australia. But the one that I find fascinating, as well as upsetting is the other children’s book author named Jennifer Adams. Oh yes, there’s another Jennifer Adams out there that writes children’s books. She has quite a few published also. So you can see where I’m going with this. I hope you can. After my first children’s book, Dana’s First Fish, became available for bookstores to purchase, I was curious to see where all it would be available. After googling my name, along with my book’s title, I found a few links that popped up. I clicked on each one, excited to see that it was on the first page of searches. I scrolled the websites page, even more excited to see the front cover of my book on the screen, on their website. Then I scrolled down to see a picture I don’t recognize and read the print beside the picture. It went on to say who Jennifer Adams is, where she lives, what she does. Fascinating, except that isn’t me in the picture, I don’t live there, and that’s not what I do. I was bummed! Upset! Who messed up here and how can I get it fixed? I sent an email to my marketing manager, and after a few days I received a response saying the distributing team will get it fixed straight away. I’m going to give it a few days before I google myself, along with my book’s title, to see if anything was corrected. Friday I went to Barnes and Noble, I just happened to be in the area. I walked around the children’s section, unable to find my book. After asking one of the desk clerks, I found out that my book will be in the store very soon, to call them on Tuesday. I was also told that they are going to add me to their book fair event that they are having in November, so that I can set up a table for a book signing. That seemed to make my day so much better to hear that. I love book fairs, especially if they are for little children. This entry was posted in Blog, My Children's Book, Needs Your Attention and tagged Australia, author, Author Jennifer Adams, author Jennifer N Adams, Barnes and Noble, book fairs, Bryant Arkansas, charities, children, children's books, Children's literature, Dana, Dana's First Fish, family, getting published, Google, Jennifer Adams, Jennifer Adams from Bryant Arkansas, parents, single mom, single parents, writing on September 29, 2013 by JenniferNAdams. Anyone who knows me, knows that I can either be found reading or reading or browsing the book shelves for something good to read. A few days before my daughter’s birthday I decided to go to Toys R Us to buy her a few things. It just so happens that Barnes and Noble is right next door. I don’t come up here often as the traffic is horrible due to major road construction and it’s quite a drive. Since I was by myself I decided to go into B&N and browse. Since no one is ever with me when I’m book browsing I will tell you this, I take forever! I like to look. I like to look at the History sections, the Science Fiction section, the Fiction section, the bargain sections, the New Released sections, the magazine sections. While I’m browsing my brain goes ADD on me, I’ll find a book and…oh I wonder if so and so has a new book out. I’ll walk over there and see if anything new of that author is on the shelf. Then a few moments later…oh wait I wonder if they have any of those books I saw last time. I walk back over to the Science Fiction area. I did however pick up three books; one of the Doctor Who books: Hunter’s Moon, Innocent Darkness: The Aether Chronicles Book 1 by Suzanne Lazear, and Falling Kingdoms by Morgan Rhodes. I also bought the latest BBC Doctor Who magazine. Right now I’m currently reading Falling Kingdoms by Morgan Rhodes. I just saw it on the end cap, either with the new releases or near them…I can’t remember at this moment. It was the cover that caught my eye…that’s usually which book I’ll pick up first, whichever will catch my eye. Then I’ll flip to the back cover to see what the teaser says, if there is one, or look for it on the inside jacket cover. Then sometimes I like to flip through a few pages and read a few paragraphs to see if it’s catchy. When I flipped the book open my finger caught a page and I saw that there was a map of a make believe world, their world for their story. I thought, neat! I liked everything I saw and read. It’s a Fantasy Fiction. I’m currently in the middle of chapter eight. There are three countries to the author’s world and each chapter switches to each country. It is not at all confusing as it sounds. There is a character from each country that runs into one from another country and so the story blends together perfectly through each chapter, so you’re not at all lost. What has happened so far… The first two countries are poor and the third country is still prosperous. The other two countries are relying on a prophecy, or magic to come back, as magic has long since died out or has been forbidden. A murder has happened and a princess was involved and now her life is in danger. I don’t want to give too much away. The only thing I hate is not having the time to pick it up more and find out what happens next! This entry was posted in Blog, Book Reviews and tagged Barnes and Noble, book review, books, Doctor Who, Falling Kingdoms, fantasy fiction, Innocent Darkness, magic, morgan rhodes, Mystery, Princesses in danger, Suzanne Lazear on January 14, 2013 by JenniferNAdams. I went to Barnes and Noble yesterday…old habits are hard to break; it’s next door to Toys R Us, the place I was actually destined to stop. I walked around the shelves, stopping by the Science Fiction, as always, and found a few Doctor Who books, as well as a few Supernatural books (also a TV show; both are my favorites). I picked out a Doctor Who book and started to look for Torchwood, they had several books the last time I was here, but I wasn’t able to get one at that time. I looked all around and even asked, but no luck, they were only on e-readers. No worries, I’ll just check Amazon and see what I can find. I continued walking around and ended up in the main center aisle where all the eye catchers are. Up front are the huge displays with the New Releases, then the tables with Best Sellers, and then the small tables with the holiday selections. I wasn’t interested in holiday selections, so I walked right passed it. Something familiar caught my eye. 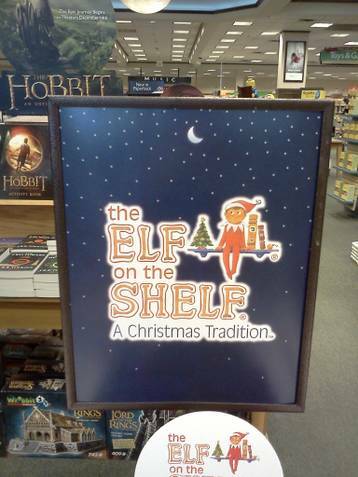 I turned, and there was a small display of the Elf on the Shelf. I let out a small laugh. There are two ornaments out for this little guy and two different books. 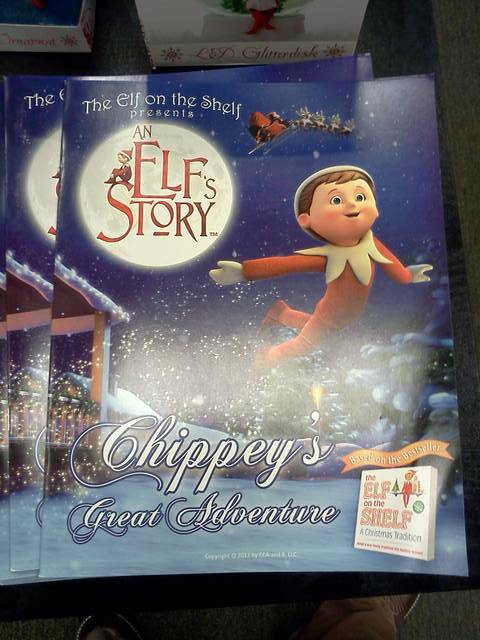 I didn’t find the Elf on the Shelf itself, though I wouldn’t have bought it anyway, or would I? I’ve been reading about this little guy here and there and I know the Elf on the Shelf is supposed to keep an eye out around the house and report all naughtiness back to Santa, that’s the whole purpose. But, the funny stories parents share about the things they do with their Elf on the Shelf, had me laughing. Some share pictures, which were too funny. Some of them were like pulling pranks on their own kids. It’s almost better than watching the Jimmy Kimmel YouTube challenges. I thought to myself, how much fun this would be if I had more than one child. Actually, with my one child and the shenanigans she gets into, it would probably be a lot of fun…probably too much fun! My grandpa was well known for his practical jokes; maybe I too should get an Elf on the Shelf and have a few laughs myself. Many of my friends and some family members are getting one or already have one. How long has Elf on the Shelf been out? 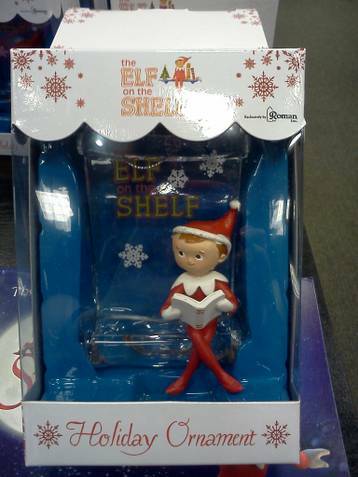 Do you have an Elf on the Shelf? This entry was posted in Blog, Christmas and tagged amazon, Barnes and Noble, books, children, Christmas, Doctor Who, Elf on the Shelf, humor, Jimmy Kimmel YouTube Challenge, kids, parents, parents pranking their kids, practical jokes, Santa, science fiction, single mom, single parents, supernatural, toddlers, Torchwood, Toys R Us on December 12, 2012 by JenniferNAdams.